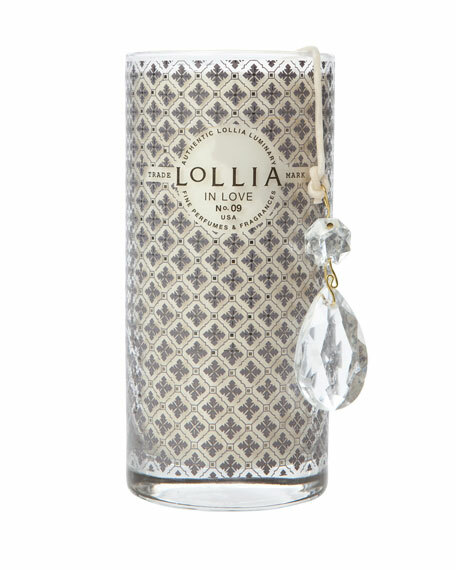 A modern interpretation of a sheer romantic floral with delicate infusions of apple blossom kissed sweetly by jasmine, floating upon the breath of the truest Living Rose. Gently transforms a space into a warm, inviting, elegantly perfumed environment. Designed to be burned alone or with its companion candle, the White Woods & Osmanthus Perfumed Luminary, to create a third unique fragrance. Soy wax blend. Elegantly tailored foulard pattern in a chic menswear inspired print presented in a purely feminine way. A perfect balance to coordinate with In Love's beautiful rose motif adorning the White Woods & Osmanthus Perfumed Luminary. For in-store inquiries, use sku #238935.